This large LED sign was recently mounted on the front of St. Paul Episcopal Church on the 300 block of Locust Street. Churchgoers at St. Paul Episcopal will soon be able to see the light - but maybe not the way they thought they would. 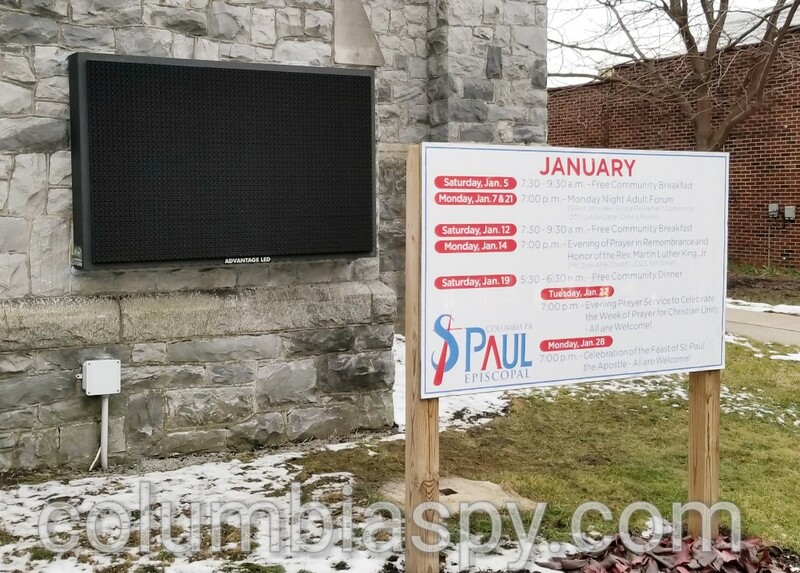 A large LED-lighted sign, which the church has owned for about two years, was recently installed - or more specifically, re-installed - at the church on the 300 block of Locust Street. The sign was originally installed on a metal stand in October 2017, even though Columbia Borough Council had voted in July 2016 not to allow the installation. (Council members Kelly Murphy and Cleon Berntheizel recused themselves from the vote, because they are members of the church.) Shortly after Columbia Spy posted THIS ARTICLE , the sign was removed - and later the supporting frame as well. An existing wooden frame remains in place for posting announcements. Sometime this past week, the LED sign resurfaced, this time mounted to the historic stone and mortar of the church's front face, using metal support strips secured by a series of large bolts. 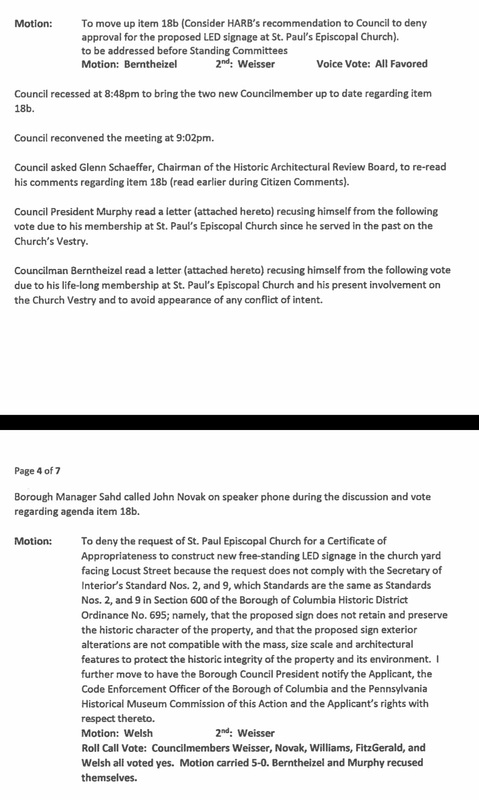 "Council denied a proposed LED-lighted sign at St. Paul’s Episcopal Church, 340 Locust St. Glenn Shaeffer, Historic Architectural Review Board chairman, asked that council create an amendment not allowing this type of sign in the future. 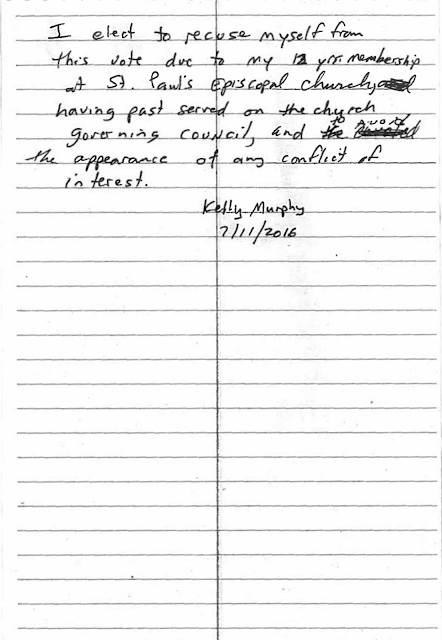 Council members Kelly Murphy and Cle Berntheizel removed themselves from the vote because they are members of the church." 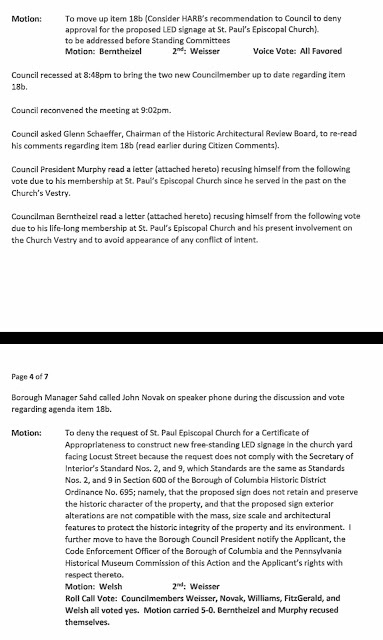 July 11, 2016 council meeting minutes regarding the 5-0 vote to deny St. Paul Church's sign request. HARB Chairman Glenn Schaeffer's comments to council during the meeting. It looks pretty suspicious that the two councilors that are the most controversial are members of this church. They have to know that this will likely require legal action that the Boro will have to pay for. 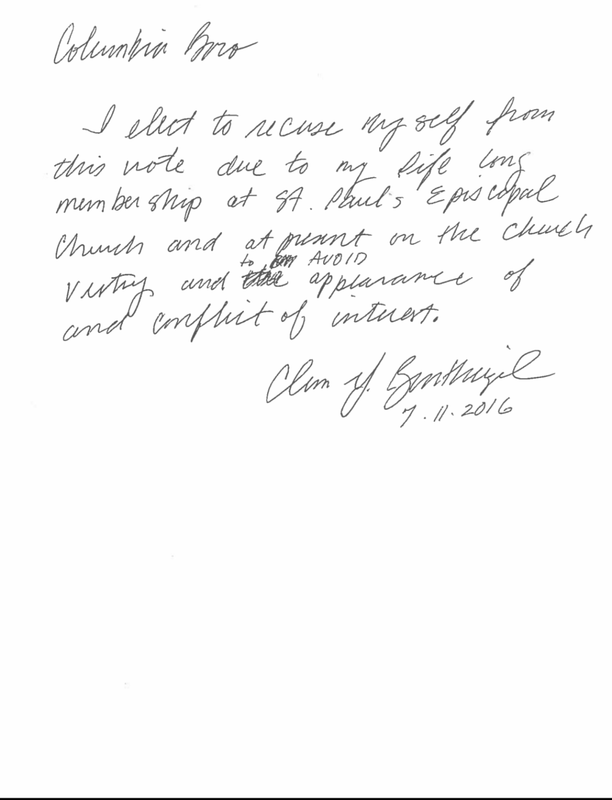 So are they using their church as a pawn for retaliation? Try again. 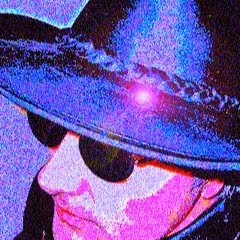 Both are against the installation and stated so publicly. Wre advised by the solicitior to recuse themselves form any vote. Call the police, that's not a HARB issue. Harp controls the signs in the historical district of locust street but not on walnut street??? BTW. Police were called. The church had a permit from Columbia Boro to install the sign. For the record, please state who you are and how a permit to install the sign was obtained when HARB did not give its approval and council did not reverse its previous decision. How about the nice store interior that got plastered over to become Boost Mobile? They should just wrap the sign with ornamental wood frame and call it a day, still period like with a bit of tech. I agree but harb and the boro has nothing to say about the plaster on the walls, they should stay out of the remodeling business, they have enough problems that they created over the years with the dictators that were and are on council, and a lack of help from the boro. The boro should help the citizens , not set up road blocks like they have done in Columbia. This is the topic: Council voted NO. HARB did not recommend it and their chairman requested an ordinance be created so this is not an issue in the future. If council and HARB can be ignored, why do we have either? The first request was for a **FREE STANDING** sign. What they installed is not FREE STANDING sign. Because they wanted that sign, and it is THEIR historic church and not yours? Who are you to demand they take it down? Who are we to demand they take it down? We are the ones sick of arbitrary rules in this damn town. Rules include churches here too. Council and HARB can tell some they must comply and tell others do whatever you want. Equality or abolish HARB and the historic district. Well, I never supported the HARB or historic district from the beginning, so I'm fine with that. The sign attached to the church seems to be permissible, vs a free-standing sign. That's the key difference. It's really historic look at Hotel Locust and that other building next to it. Nice for visitors to see on our Main street huh? back door again , helm gave the garage permit for the twin towers off manor street ,then took it back , look what we got out of it, the church should be able to do what the permit stated. another boro fart. Wow Helm make yet another mess, Retire with the one from Wrightsville that HATES Columbia, start to clean house now ,they will be cleaning after November elections. Yes Helm gave a permit now wants to take it back again , same as the garage that is now separated into two sides , and are called the twin towers , yes it went to court and he is doing it again. Retire or be fired , just think of him doing health and resturent inspections, I don't think of this when I eat in Columbia , but we all should. Helm , Lutz , Murphy all got to go , Boro manager too...…. Cleon and the remaining council need replaced.